I've used a standard 5% salt and water solution to brine a chicken, after having brined it is it advisable for me to season the chicken with salt before cooking it? I'm worried that if I do so that the chicken may become too salty; am I wrong in thinking this? If it is the case that the chicken CAN be salted after brining; what concentrate of brine would be needed so that salting is not necessary after brining? 7%, 10%? Myth busters beware, are you ready? Go! No brining nor seasoning will make your chicken too salty. 5%, 7%, 10%, The only sodium saturating process known to men is the injection, the needle injection, the so called "added solution". If you're only brining, you're miles away from needle injection consequences, yet another misunderstood process. Brining is not to be feared, injections is. the type of meat, the thickness of the meat, the duration of the brine/marination. You can debate this thing for days and years, but what matters here is the question. The assumption is "I marinated (5%) a chicken and now that my marination is over, I'm thinking of seasoning (salt) before cooking. Am I running a risk to saturate the end product with sodium?" The clear answer is NO, as long as your brine didn't last weeks, or your meat was not previously injected with a sodium solution, e.g 12% or 15%. The only time you have to worry about salt seasoning is when your meat has already been salted with injection, or if you just managed to cook a peace of meat with a higher than 5% salt solution for more than a week, which won't happen unless we are talking about dried cured meat, which is an aberration as I've never seen it. Please be careful with references to articles, books, so called scientific published papers. You really need to read them slowly and carefully, interpretation is key, understand where they came from, who wrote them, who paid for it, who's getting paid for it, which is the source, ... etc, even if the almighty gods of molecular gastronomy are named on it. FYI: I've been fighting a few USDA/FDA strict rules for years (e.g. caning, meat temp), while believing their overall work is awesome. I agree with @rumtscho that you should not need to salt after brining. However, I totally disagree with the accepted answer. There are simply too many reputable sources that say otherwise, not to mention my own experience. First, please see the accepted answer to this question which is from Cook's Illustrated. Secondly, this article from Stella Culinary gives a very detailed description of what brining is and how it works. Please see excerpts below. What Is A Brine and Why Should I Use It? 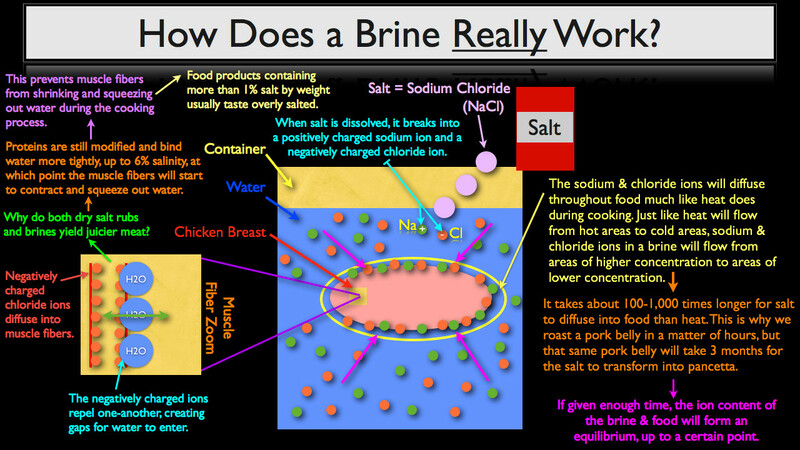 In its simplest form, brine is a salt and water solution that food products, most commonly meats, are soaked in for a given period of time to improve the product’s overall quality. Textural improvement, especially when brining proteins. This is a very good article and gives an in-depth look at brining. I personally use a gradient brine (5%) or dry rub and I can personally attest that the salt does get into the meat. No, I do not cook my brined chicken with added salt. I always brine chicken overnight with maybe a bit more salt than is standard. The next day, I rinse and soak it briefly in clear water, then cook it without adding salt. It is always salty enough from the brine and very few people eating at my table ever add salt. From my taste buds, I believe chicken does absorb salt from brining even though others insist it cannot be absorbed. I respectfully disagree. Not the answer you're looking for? Browse other questions tagged chicken flavor salt brining or ask your own question. Can I use chicken brine as a base to make a broth?